The first few days back to school after winter break are always a struggle. 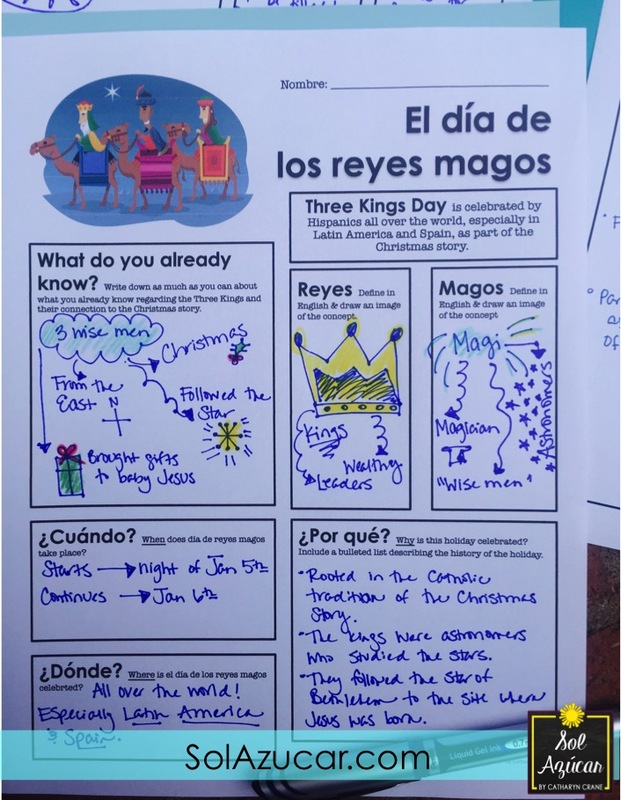 Luckily for us Spanish teachers, Three Kings Day falls on January 6th, right around when many of us are returning to school. 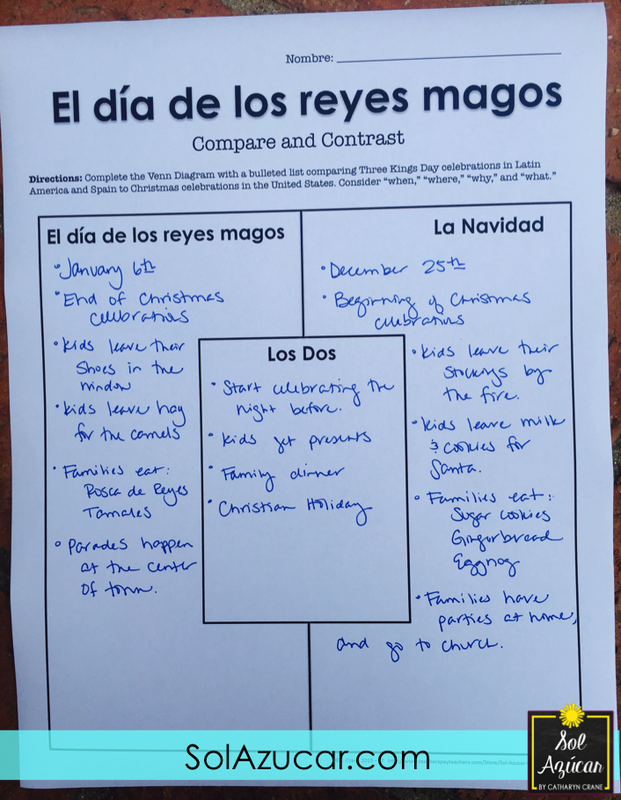 I love to teach this one hour lesson during our first week back, as a way to ease students back into “learning mode” while exploring the cultural practices associated with the celebration of Three Kings Day in the Spanish-speaking world. 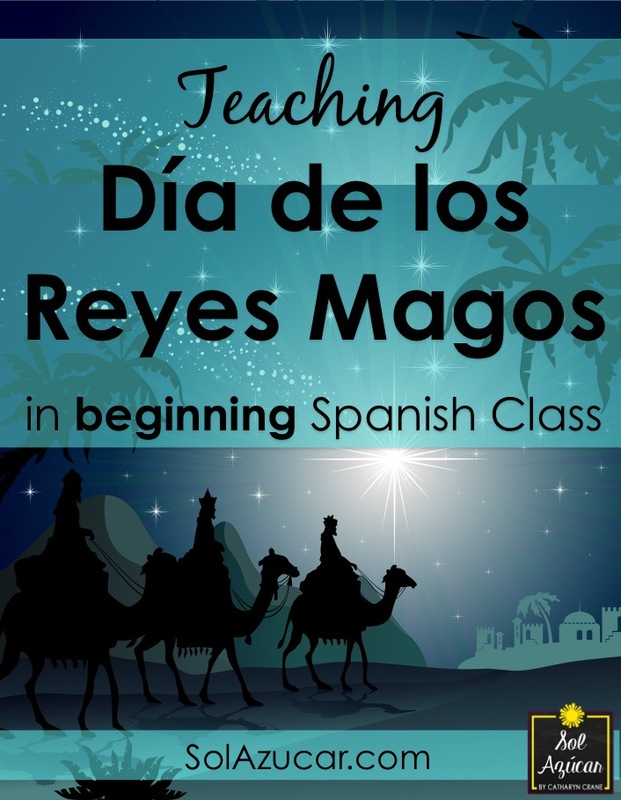 The lesson is designed for beginning Spanish students (I teach mostly 9th graders at the beginning level), who have minimal prior knowledge of this holiday. I teach the lesson primarily in English, while highlighting key terms in Spanish, although you could easily teach it 100% in the target language. 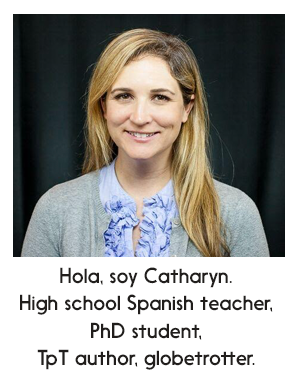 I decided to teach it in English because it allows me to discuss more complex cultural topics and nuances with students in their native language, rather than relying on more simple target-language structures. It also is a soft way for students to get back into the learning mindset, without bombarding them with 100% target language content on their first day back to class after the winter break. Culture is a great way to get students to buy into studying a language, so I want them to really understand and appreciate this holiday! That’s just my reasoning, as I said, the lesson could easily be done in 100% simple Spanish! This lesson includes religious content. While I taught at a public school and do not value teaching religious content per se, I do value teaching students about other cutlures. Religion and culture are somewhat inseparable. 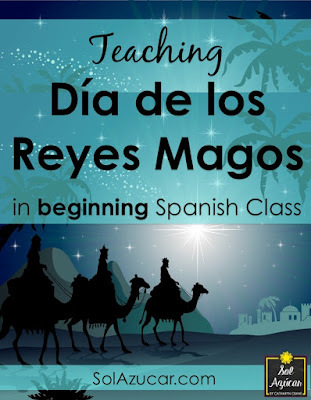 I teach this content in a direct way, encouraging students to view the practice of Reyes Magos as sociologists, who aim to expertly understand the nuances of another culture, not to judge. I encourage students to embrace their own unique cultural and religious backgrounds and opinions, to be cognizant of how these beliefs and practices influence their unique interpretation of the lesson itself! 1. 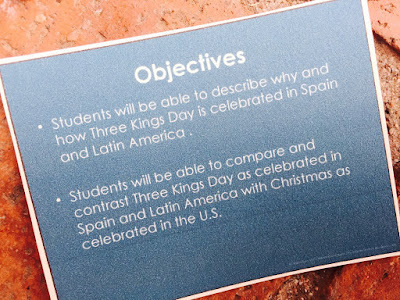 Students will be able to describe why and how Three Kings Day is celebrated in Spain and Latin America. 2. 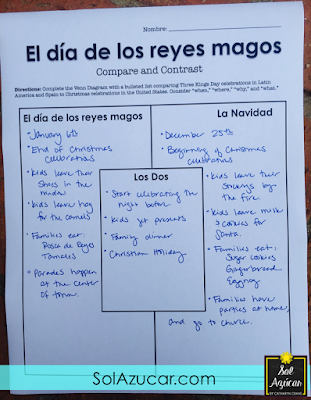 Students will be able to compare and contrast Three Kings Day as celebrated in Spain and Latin America with Christmas as celebrated in the U.S.
As a way to prime students learning with prior knowledge on the topic, I like to begin the lesson by asking students to write down as much as they can about what they know regarding the Three Kings and their connection to the Christmas story. Students work individually or in pairs/small groups to brainstorm what they know about 3 kings, the holiday, etc. Encourage students to write in bullet form or draw their responses. 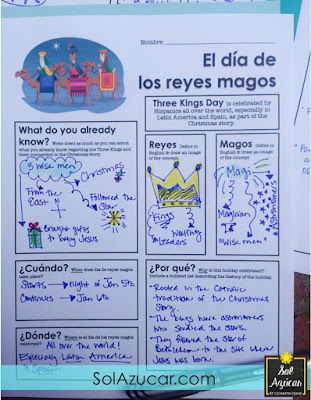 Invite students to share what they know about 3 kings, the holiday, etc. (call on students to share verbally to the whole class OR to come up and write an idea on the board OR to share verbally in small groups). You might give them each a sticky note to write on, and post on the board. 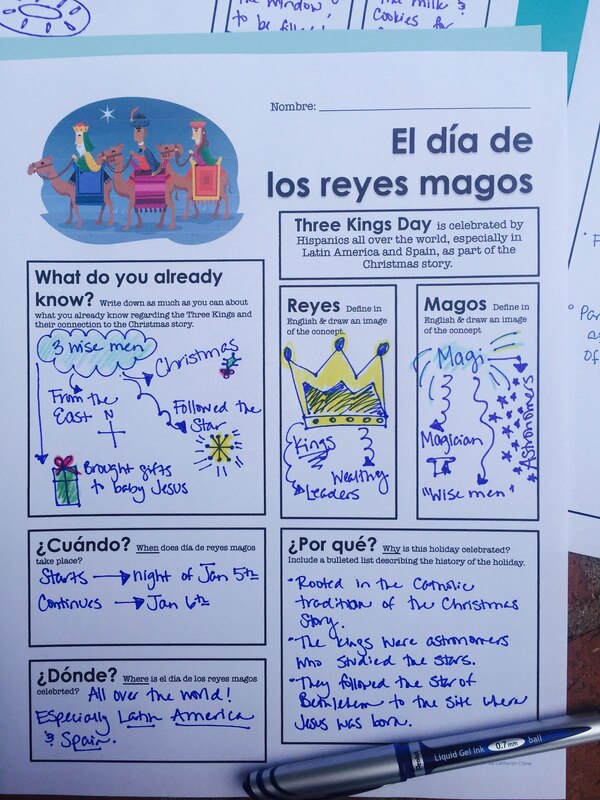 I start presenting new content relating to reyes mags by showing this video of día de reyes magos at Disneyland. This clip is 1 min, 25 seconds. It’s pretty fascinating that Disney has taken this on, starting in 2012. It is absolutely a sign of the Hispanic influence in US culture today. Technically the 3 wise men were not kings, but magi, or scientists from the East (think Asia) who came to Jerusalem to welcome the baby Jesus. In ancient times, scientistis, astronomers, and magicians would have been somewhat synonymous. These were “wise men” who studied the stars. 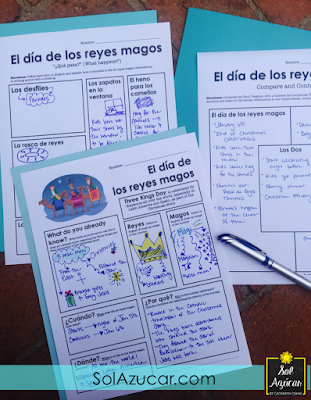 Then we go through and discuss reyes magos in terms of when, where, why, and what. I have students take notes on a graphic organizer like this. You could also have students create mind maps or knowledge webs, keep their own notes in their own preferred format, or treat it as an open discussion with no note taking needed. When: Celebrations start the night of Jan 5th and proceed on Jan 6th, which is Epiphany. Where: Where is it celebrated? Really, el día de los reyes magos is celebrated all over the world, anywhere that people chose to celebrate it. Predominantly it is celebrated in the dark blue regions as well as the US (where it is becoming increasingly popular due to Hispanic culture in the US). Why? Here we focus on the history and philosophy behind the holiday. It is rooted in the Catholic tradition of the Christmas story. The kings were astronomers, who studied the stars. They followed the star of Bethlehem to the site where baby Jesus was born. They believed Jesus was the son of God. They brought him gifts of gold, frankincense, and myrrh. Desfiles: Parades happen on the night of Jan 5. Zapatos en la ventana: Children leave out their shoes to be filled by the wise men when they visit on the night of the 5 (like stockings for Christmas). Nowadays, like Christmas, the Kings place their gifts under the Christmas tree like Santa does. El heno para las camellos: Children leave hay for the camels in their shoes, kind of like leaving milk and cookies for Santa. La Rosca de Reyes: This is the Kings Cake. It is often more oval shaped than round, so it can feed the whole party. Candies symbolize the crowns of the kings. The tradition started in 1300s in France, then transitioned to Spain, who transitioned it to Latin America. It is still used in France as part of mardi gras (Fat Tuesday – happens 40 days before Lent, in the spring each year). El muñequito: The rosca has a muñequito hidden somewhere inside (also known as el monito). This refers to baby Jesus – hidden in the cake like Jesus had to be hidden from King Herod in the biblical story. In Spain, whoever finds the baby is “king for the day” and has to pay for next year’s Epiphany party (or roscón). In Mexico, whoever finds it has to bring the tamales for the next party… see next slide. Tamales: According to tradition in Mexico, whoever finds the muñequito is responsible for throwing the party for el día de la candelaría on Feb 2. That person has to bring the tamales. With my smaller and upper level classes, I always bring a rosca and when students agree to take a slice, they agree that whoever gets the muñequito will bring tamales for the class on Feb 2. Excellent tamales are easy to get here in AZ, so it has worked out beautifully in the past. With any leftover time, students work individually, in pairs, or small groups to complete a Venn Diagram, comparing Kings Day and Christmas. This is a way for them to summarize what they’ve learned over the lesson. It can also easily be assigned as homework if the other portions of the lesson take longer than expected. I organize my lesson using a PowerPoint and set of student graphic organizers, to keep me organized, they're for sale in my TpT store, but you can easily make your own. Would love to hear your thoughts on how you might modify this lesson to fit your students' needs and teaching style.